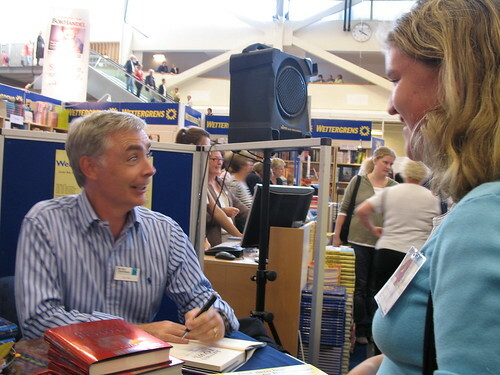 For one mad moment I consider not interviewing Eoin Colfer at all, wanting instead to ask him to be funny for half an hour. The day before my two children and I had seen Eoin with Angie Sage at a seminar on children’s fantasy novels as part of the programme offered by the Gothenburg book fair Bok och Bibliotek. Thinking back, it seemed that it had not been so much of a seminar with sober discussion, but more of a one man show. A show with Eoin Colfer entertaining the audience with stories about his supposedly horrible brothers and the unfair treatment he got from his mother and his wife’s wish for money to pay the bills with. All of it fantasy, I’m sure. 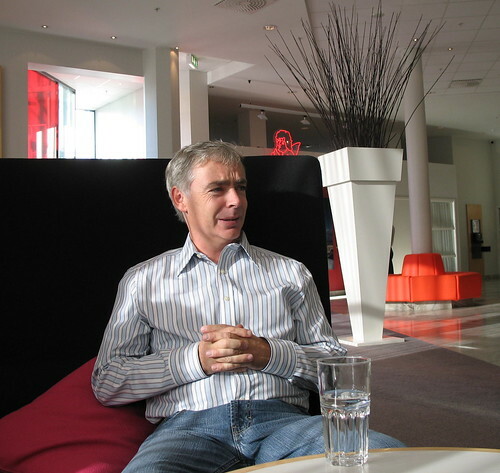 Waiting for Eoin in the lobby of the Gothia hotel earlyish the next morning I start worrying about whether one can trust this charming Irishman to have got out of bed in time. In fact, since he is flying home shortly after our meeting I wonder whether he has even packed. This may be an unfair thought about the man who created Artemis Fowl, the ultimate planner and perfectionist, but I thought it regardless. Eoin arrives three minutes early and Lotta, his Swedish publishers’ representative, heaves a sigh of relief. I mention my thoughts on his suitcase status, wondering whether he could have done with some help. I suppose I may have been the first interviewer ever to offer this service, because he looks taken aback but says that he would have considered it had he known. Lotta scuttles off in search of coffee, leaving us to chat. Eoin Colfer would be surprisingly easy to miss if you saw him in the street as he looks nothing like his photograph in the books. My first thought is to point this out to him but then I realise that it’s probably his cunning way of disguising himself. He claims that he gets recognised by readers because he owns only one jacket and people remember him by that, and by his shirt. He owns two shirts. Yes, of course he does. Having failed to find coffee Lotta panics, but Eoin settles for a glass of water. So he is clearly no primadonna. I tell him that he was announced at the previous day’s book signing as Eoin Fowl. This apparently happens all the time. He is relatively unknown in Sweden, which explains why the girl in the bookshop had no idea who she was announcing, although Artemis Fowl has been selling well. 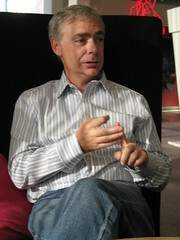 Eoin Colfer is known for not wanting to travel much, but he has just returned from the US and will go back there after Sweden, and after that will perform for his fans in a London theatre. This sounds like anything but the life of a recluse and Eoin agrees that it’s getting to be too much. He desperately needs to sit down and actually write books now. But at the back of his mind is some advice from Terry Pratchett on the necessity of travelling and meeting the fans or you face losing readers. I mention I was surprised that he has had two books out in 2006 and it seems it only happened because he finished early and the publishers were keen to publish. Well, they would be. Eoin’s first book about Artemis Fowl turned up in the shops five years or so ago. It was hard to know what to think of Artemis. Can you like and approve of a twelve-year-old master criminal who feels it’s all right to steal gold from the fairies? It wasn’t entirely easy to know whose side the reader was supposed to be on, and this apparently is what Eoin Colfer wanted us to be unsure of. In the end you sort of quite like both sides, and it’s excitingly reassuring that you can’t tell what’s right from what’s wrong. In the next three books about Artemis Fowl the friendship between the readers and Artemis and the fairies deepens and you learn a satisfying amount about criminal behaviour. I asked Eoin if he feels Artemis is a good role model for his young readers and he unhesitantly answered yes. So that’s all right then. Half Moon Investigations was published in early 2006. It is a stand alone book about a very young private investigator, Fletcher Moon. For the child reader it is a wonderful detective story, with plenty of humour as usual, and for the adult reader the book provides a new take on hard boiled PIs. Eoin says there was some doubt about the suitability of this during the writing of it, but it was left so that the young reader wouldn’t lose out, while leaving enough for the adult to enjoy. I pointed out it was a shame Eoin just missed seeing Sara Paretsky at the fair, as she has her own version of the hard boiled PI. His second book this year was the fifth instalment of Artemis Fowl; Artemis Fowl and the Lost Colony. It provides a host of new openings for future plots and it looks as if Artemis is anything but on the way out. He has reached puberty and it‘s amusing to see that this can do more to derail his thought processes than all the fairies and earthly criminals put together. For us girl readers there is also a hint at romance, despite the fact that Eoin Colfer admits to being the kind of boy reader who won’t read anything that looks girly, unless his grandmother forces him to. I ask Eoin about the future for Artemis and he has plenty of ideas, although he hasn’t made any decisions as yet. At least not that he will talk about. There might be romance, and he may write more about Minerva, but not necessarily as Artemis’s girlfriend. He hasn’t decided yet what to do with the fact that all the characters apart from Artemis have aged three years. But Eoin looks happy at the thought that he could do just about anything with this situation. When I inquire whether he’d consider setting part of a book in Gothenburg, he mutters something about Finland, so quite possibly not. He gets requests sometimes, which is how he came to use Barcelona in book five. Many readers want to know how he comes up with all his seemingly well planned and complicated solutions to every problem faced by Artemis or Foaly. Usually he asks his brothers for help by outlining where he is and what he needs to happen. And then they had better come up with something. Not much seems to have changed from when Eoin allegedly made his friends do as he said when they were children. In those days it may have been Vikings and now it’s fairy technology. The book Eoin Colfer is working on now is not the next Artemis Fowl. He describes it as historical science fiction, a bit like Jules Verne, and set in the late 19th century. He looks quite excited by it and it certainly sounds like the kind of thing his readers will enjoy. Eoin estimates that he writes a book in about eight months, which should mean that we won’t have too long a wait. He thinks he might write another story about Half Moon, and there could be a follow up to The Supernaturalists at some point. When asked whether there will be an Artemis Fowl film he says yes. At least he is talking to someone about making a film. They walk around Dublin and drink Guinness and he believes they will one day get round to discussing filming as well. I think it could be that Eoin is rather good at avoiding giving precise information, and quite right he is too. We’ll find out when he is good and ready. Eoin Colfer is very modest. Maybe he really did start writing because he needed to pay off his credit card bill, as he claims. Maybe he really did believe that only a few thousand people would read his book. As he points out, you don’t need to sell that many copies of a book to top the bestseller lists in Ireland. He also believes that the Artemis Fowl reader belongs to a very limited age group and seems somewhat unconvinced when my 17-year-old points out that he and his friends still read Artemis. Maybe Eoin has had bad experiences in schools where he feels the pupils only turn up because it gets them out of Maths. And when doing promotional tours, has he really been met with bikes or donkeys? Though I think he’d be quite at home on a donkey. 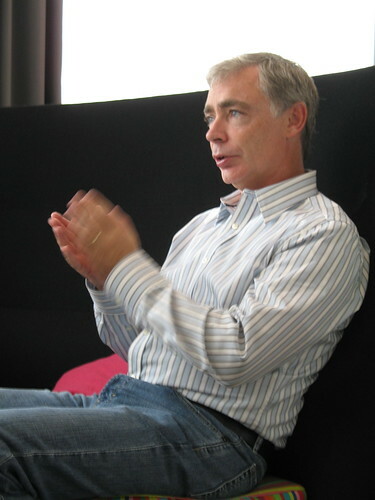 Our time with Eoin Colfer is up and Lotta comes back to put him in a taxi. When asked how his books sell in Sweden she just looks very happy and since we can’t see a donkey anywhere I daresay he does all right. My teenager then throws his standard question at Eoin which he asks of every author he meets; Will he say something about Philip Pullman, please? Eoin smiles and says that Pullman may be taller than he is, but he has got more hair. After waving to Eoin we stand and look at the glass of water he left behind. But we decide we’re not Artemis Fowl and we don’t need to steal anybody’s DNA. We leave it on the table as we push our way back into the heaving mass of the Gothenburg book fair. Have just stumbled on your blog (through a link on Meg Rosoff’s site) and am enjoying it very much. My son and I saw Colfer speak in Vancouver and it was great to see the way he enthralled the crowd. And afterwards we ran out to buy him jellybabies to watch him bite their heads off – this will make no sense unless he repeated that bit of the shtick about his brothers. Looking forward to having a good browse round your blog. Welcome Sara. I like people who like Eoin. Will check out your blog, too. Well, I think we have a few faves in common. I adore Philip Ardagh. When he read in Vancouver he prefaced his remarks by saying that he had a cold and that someone here had told him to drink lots of liquids. “Do you drink a lot of solids in Canada?” he asked the audience. My son still laughs about this years later. I’ve just been introduced to Moomins by one of my students and need to order a copy. Thanks for the reminder. Yes, Philip is special, and has a very good way with very ordinary phrases. Drinking solids… I’ll have to remember that one. And on a day when he met about 300 children and signed their books, he could still remember the names of both of my children and Son’s girlfriend, to shake hands and say good bye. I could barely remember my own name at that point. Also sent me a Christmas card, with an authenticity stamp, which is so reassuring. Is it fair to say we both like funny men? Yes, he was quite lovely to my son as well. And I’d put him in a special class (along with Daniel Handler and Mo Willems) of writers who are very good about answering reader mail. I just found your blog by a complete accident, when I subscribed. I thought I was subscribing to interviews but your blog is BRILLIANT! Thank you for this interview. I love that you didn’t just put what you said and what Mr. Colfer told, you adapted it to a story-like theme. I love it.